Today’s guest on Soulful 7 Conversations is a mentor and a dear friend. Tallu Schuyler Quinn is a mother, wife, artist, activist, and the creative heart and soul of The Nashville Food Project. She brings to her day-to-day life a pure heart, a deep authenticity, and a beautiful faith. We met eight years ago via Skype while Tallu was doing relief work in Nicaragua. I thought I was just interviewing her for a position at Nashville Food Project, not knowing then how much she would influence my own spiritual faith. 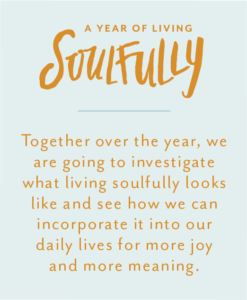 We have created and participated in many hopeful and healing liturgies, shared our joys and sorrows, swapped delicious recipes and inspiring literature, and relished many a soulful conversation. Tallu is one of those people that always elevates the conversation, makes it sacred. I hope you listen to our conversation with a pen and paper, because Tallu imparts some beautiful truths that I am convinced will fan the light inside you. She is honest about the struggles of being human, while at the same time confident and trusting in God’s abiding presence in all things. Her secret to living as Mary Oliver says, “this one, wild and precious life,” is gratitude for the whole of it! In this season of thanksgiving, I invite you to check out what Tallu and her remarkable team at The Nashville Food Project are doing to alleviate hunger in Nashville. Over the last eight years, Tallu has created gardens all over the city so that people could grow and cook healthy, delicious food together in community. So many, living less than five miles from my dining room table, barely get the nourishment necessary for survival. Many of them are children. Tallu and her amazing team at Nashville Food Project love through food. They set tables for many. They tell people that haven’t heard it in a long time: You are beloved. The spiritual life never happens in isolation. 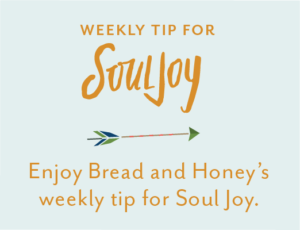 To live soulfully, is to love beyond ourselves for one another. Thank you for being the Ground of Our Being. Wherever we go, whatever has been or will be—–You are there. Thank you for Love, the ultimate cure. To love and be loved, could there be anything more marvelous? Thank you for grace, Your calling card. When we step back, we see it as the shimmering thread woven into the fabric. Their beauty daily saves us. Thank you for mercy. How many times do we miss the mark? Thank you for peace, that mysterious peace, that comes in moments of terrific vulnerability. And we rise for another day. Thank you for the divine spark within. Yes, we are human with many a limitation. But more, we are of You. And You of us. Always, You find a way. Thank you for Your Son who shows us how to live a life of love.